Flip a coin, if heads this attack does 1,000,000,000,000,000 damage. ( quadrillion damage) this attack dosent really need an energy. 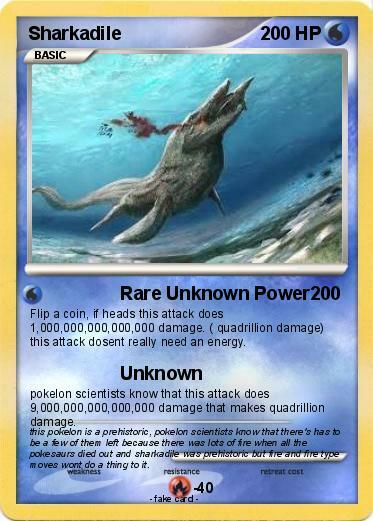 pokelon scientists know that this attack does 9,000,000,000,000,000 damage that makes quadrillion damage. Comments : this pokelon is a prehistoric, pokelon scientists know that there's has to be a few of them left because there was lots of fire when all the pokesaurs died out and sharkadile was prehistoric but fire and fire type moves wont do a thing to it.